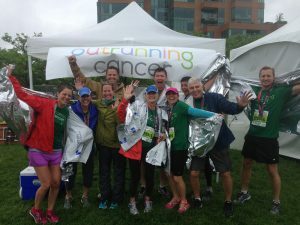 Outrunning Cancer 2016 – big soggy success! 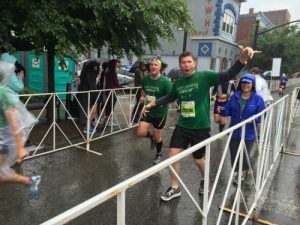 The rain couldn’t dampen our sprits as 130 runners & walkers took to the streets of Louisville to outrun cancer as a charity team in the Kentucky Derby Festival Marathon. With the help of over 630 donors we raised $68,000 to support people facing cancer and metastatic breast cancer research. 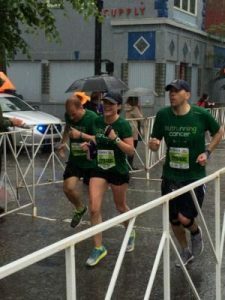 To read about the race in Lara’s words check out the “My Hopeful Life” blog post about this special day! The word stable never carried much weight before. But, today the word stable is a lightning rod of hope. My PET scan showed stable disease! Which means the drugs I am on are still working! HUGE, SIGH OF RELIEF. This is really great news because the current endocrine therapy I receive has minimal side effects and a very high quality of life. The fear is eventually their impact will lesson, but we don’t live in the perceived future. Today – they are working! Halleluia! Yet, in my joy and relief I am pained with sadness. Sadness for a dear friend who died this week- one of the most beautiful, vibrant souls I have had the chance to meet along this journey. Sadness for several friends whose tests this week revealed progression and now face the scary process of changing treatments… Sadness for friends whose treatments are working, but cause them so much pain and fatigue that the treatment itself is destroying them. It’s hard to celebrate when you know the reality. It’s hard to celebrate when friends are crying… and others, dying. But, I know that those friends would encourage me to live in this moment of health and joy. Live in it fully and embrace it with gratitude. Because we have seen the sadness and felt the pain, I think we feel the health more deeply. And, we see the joy more clearly… even in the littlest things. I’m grateful beyond words for this continued time of health and strength visit homepage. 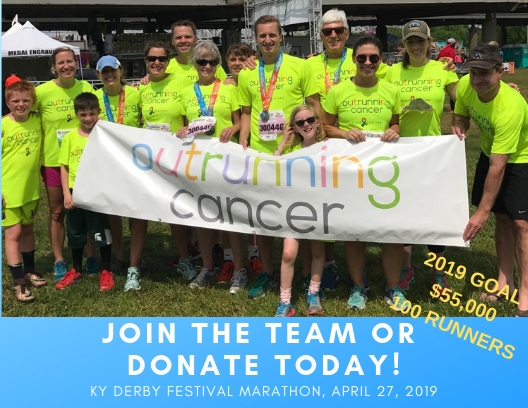 Next Saturday I will run the Kentucky Derby 1/2 marathon as part of the Hope Scarves Outrunning Cancer team. Two years ago I wouldn’t have thought this possible. I’m not sure my hips think it’s possible this year…but I am doing it. One foot in front of the other for 13.1 miles. 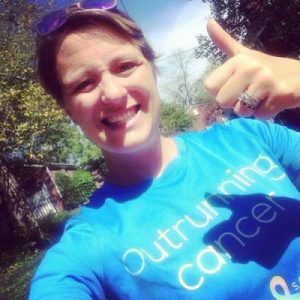 Each mile for a friend battling advanced cancer. 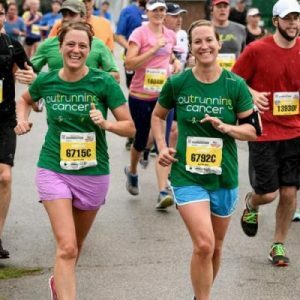 If you would like to show your support please make a donation at www.runsignup.com/lara Money raised supports the nonprofit I am honored to lead (Hope Scarves) and metastatic breast cancer research. With gratitude and a full heart I will put one foot in front of the other, rain or shine on April 30th thankful for this time of health and stable disease. I will laugh, cry, love and help others. This time will NOT be wasted. Each day is a gift. Before me- the ocean and crashing waves, palm trees, our long dock leading to our picturesque palapa with its thatched roof. Before me- the unknown of cancer,progression, sickness, fear, loss. Sadness. 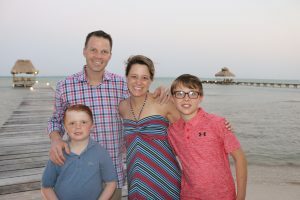 This is vacation with stage iv breast cancer. I say cancer doesn’t come on vacation because in the midst of the snorkeling, fishing and cave tubing – it doesn’t cross my mind. But in the still of the morning asI watch our kids digging for hermit crabs in the sand in sneaks in. It clenches my heart. Yet, it doesn’t have hold. Happiness and hope run deep. Being with our family and facing days of adventure fuel this hope. Stoke it like a fire inside me. Yesterday we kayaked out the reef in front of our villa where we found a shipwreck full of fish and brilliant coral. The hallowed out hulls of a catamaran arched toward the sunlight as yellow tail and blue tangs darted in and out of the shadows. Nervous at first our kids clung to the kayaks peering down at the shipwreck. Bennett hugged my neck, his snorkel dangling beside his face and asked if there were skeletons down there. With a little laugh I assured him there were not. I pictured what was going through his mind, a skeleton with an orange life vest wedged in the cabin, a full table setting before him…. He’s seen Goonies about 10 times. Once we had that settled – the boys were all about it. Diving down, gazing at the world of life that came from this disaster. After about 10minutes I told Jay, “I have to swim through it.” The arch of the hull was about 15 feet down and about 4 feet high. I tested my breath and my speed and was sure I could do it. This is how I live now – I long to push myself. To risk. To feel exhilarated. To show our kids how “adventurous” their mom is! Diving down and swimming through the dark tunnel I felt strong and daring. I felt alive! Coming up, gasping for air, full of a sense of accomplishment – this is living! I encouraged everyone to try it and we did –one by one diving down and racing through as the fish scattered in different directions. My dad was the last to go through. Calm and observant he dove down slowly to take in all the fish and coral (unlike the rest of us – who were much quicker in our attempts). When he came up he looked at us and said, “Did anyone see the shark?” We all laughed at one of Grandpa’s many jokes…. “No, really. There is a shark in the crack of the hull right before the arch.” Immediately the boys hightailed it back to the kayaks. We each dove down again to get a better look. In the dark crack of the hull you could make out the outline of a giant nurse shark – resting inches from the opening to the arch. I looked directly into his beady eyes. Laying there in the shadows- a good 6-7 feet. It wouldn’t hurt us,nurse shark are docile – but it was terrifying to discover. There it is- life, joy, accomplishment. And- lurking in the shadows…fear. But, you have to dive down. Take the risk, live the life, have the adventure. Because if you don’t all that’s left is fear. A life wrecked in fear is a life only half lived. Here I am – flying off to a tropical island with a mimosa beside my laptop eager to embark on another family adventure. (One of the perks of jays frequent travel is the bump to first class and his generosity to give the seat to me!). As with all our travel, there isn’t room for cancer in my carry on. Cancer is left at home. On vacation, I am just me. We are just we – a happy family on vacation! But, last night as I was whipping off a couple quick emails before I unplugged for vacation. I received an email from the mom of a scarf recipient. I had sent Jessica a follow up email about our hospital program introducing our new Partnership Coordinator and inquiring if she was still trying to get a program started in her home town. Her mom informed me Jessica died. That morning I had rolled up a banner we use for events with bright hopeful faces of scarf recipients. Jessica’s beaming smile at the center of the banner reminded me to drop her a quick email. I had no idea she had become so sick. I didn’t know. She died. Tears streamed down my face as I jammed snorkels, sunscreen and a deflated soccer ball into a bag – writing myself a note not to forget the pump to blow it back up when we landed in the islands. How can life be so unfair? Why is it that we can’t stop this awful disease from robbing families of loved ones? How precious and fragile and fleeting is this life? Damn it cancer. Damn you! Jessica was a dancer. Teetering between health and sickness. I had treatment yesterday… as I waited for my lab results for my xgeva injections the nurses and I talked about spring break. I quickly changed the subject from my tropical adventure, as I looked around the lab at the tired, sick,worried patients surrounding me. Clearly not going on vacation the next day. It’s like an entirely separate existence – cancerland. Where people live treatment to treatment. Where the side effects and fears dwarf any normal worry like a broken iPhone or flat tire. Wobbling between these two worlds is bizarre. I left the cancer center to rush to lunch with friends where the conversation happily swirled from vacations to summer plans and our silly children. Such simple, happy topics easily taken for granted unless you balance them in comparison to the conversations of minutes before about blood counts, calcium levels and tumor markers…. I’m grateful beyond words for this time of health. Yet, even though cancer doesn’t fit in my carry on, it clings to me. The nagging fear of when it will return threatens my hope. I run from it through travel. I know. I feel so alive when doing new things and unplugging from reality. To just be with our family- making memories I hope beyond hope our kids remember. But, Jessica, and so many others we’ve lost to cancer, aren’t far from my heart. Her pain is my pain. Her hope, my hope. Anyone who has faces cancer knows this feeling. Yet, we carry on. We stumble, get back up and stumble again. And with any luck we dance. The greatest lesson I learned facing cancer as both a survivor and having loved ones with cancer is that life is precious.